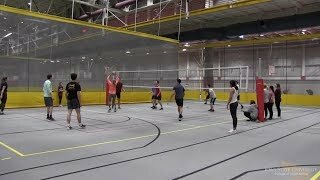 MSE GOLD, Materials Science and Engineering Graduates of the Last Decade group, continues the strong MSE student community into alumni life at Iowa State University. The MSE GOLD program allows alumni to reconnect with friends, network and share opportunities with other alumni and student mentees. Since accepting the offer to be on the MSE GOLD leadership team, Rueschhoff has been an important part of getting MSE GOLD up and running and plans to continue her participation and mentorship for materials engineering students, like Rebecca Whitesell, now an MSE graduate student. 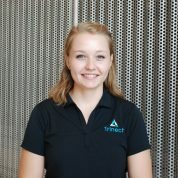 Whitesell has been selected an ISU Trinect fellow. Rueschhoff has been Whitesell’s mentor since they were matched this spring, during Whitesell’s senior year of her undergraduate program. 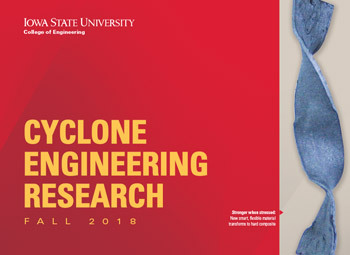 Whitesell is staying at Iowa State to pursue a master of science in materials engineering and will continue Stephanie Choquette’s research. She applied for the position after working in Iver Anderson’s research group as an hourly lab assistant, learning about the research and continuous improvement of lead-free solders and iron-based oxide dispersion strengthened alloys. Whitesell made the decision to stay at Iowa State to pursue this degree after deliberating with Rueschhoff. “I was nervous about pursuing an advanced degree where I had completed my undergrad, but Lisa was really able to ease my worries by explaining how common it is for students to stay put – especially because there are amazing research and academic programs available at ISU,” Whitesell said. Rueschhoff advises all graduate students to choose the department and adviser that feels most comfortable and invested in their success. Whitesell, originally from Westminster, Colorado, chose to begin her adventure at Iowa State after visiting the U.S. Department of Energy’s Ames Laboratory, where she got the chance to see copper plasma spray and a high-velocity oxy-fuel spray in action. 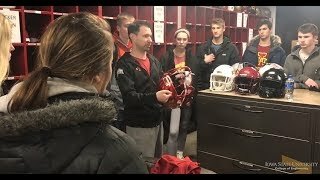 According to Whitesell, Iowa State is unique in that the Ames Laboratory is right here on campus. “Other schools may be 20 minutes away from a national lab, but it’s an amazing opportunity at ISU to get to see academic materials research and government-driven national lab research as a student,” Whitesell said. Rueschhoff also values her time in the MSE program. As an undergraduate, Whitesell worked at Ames Laboratory in single-crystal research, and at the Center for Non-Destructive Evaluation on a High-Energy X-Ray Diffraction (HEXRD) prototype project. “I really valued both experiences because I had the chance to see government-funded fundamental research at Ames Lab, and more practical consulting-type problem solving research at the CNDE,” Whitesell said. Whitesell also had summer internships at the Alcoa Research Center and Naval Nuclear Labs stemming from connections made at CNDE networking events. After Whitesell’s mentor at the CNDE retired, she began to work for Dr. Iver Anderson’s powder group at the Ames Lab, where she helped with post-processing and data collection of additive manufacturing metal powers produced by gas atomization. 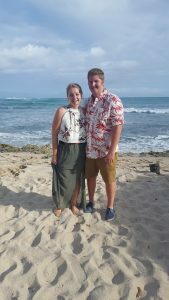 Whitesell and fiance, Sam Fer, this summer in Hawaii. “Taking that undergrad hourly position led me to where I am today, as I will be continuing in Dr. Anderson’s group in the fall studying lead-free solder and iron-based oxide dispersion strengthened alloys,” Whitesell said. She was also involved in the ISU Crew Club, and she loves traveling, baking and dogs. Whitesell has been selected as a 2018-2019 Trinect Fellow, a program run by ISU and partners with the Des Moines school district to introduce engineering to third- through fifth-grade students. “Hopefully this program will help me determine if I want to pursue a career in academia and teaching, or if I would rather work in industry,” Whitesell said. In addition, Whitesell is engaged to ISU senior in mat e, Sam Fer. The couple met during their undergraduate degree program. Other MSE GOLD leaders include Seth Berbano (‘11), Nathan Podjenskin (‘16), John Solomon (‘12) and Anne Stockdale (‘09). To sign up for MSE GOLD, click here. To connect with MSE GOLD on LinkedIn, click here. If you’re interested in becoming an MSE GOLD mentor, click here. For more information, email Andrea Klocke, academic adviser, at aklocke@iastate.edu.